Tarpon are a highly sought after gamefish on the beaches and passes off Anna Maria island. They are famous for big jumps and tenacity and will challenge any angler with their power. Anglers seeking big fish in passes, channel, deep bays, and surf areas like stout tackle with lines testing at least 30 pounds. Capt. Tom Chaya uses mainly "PowerPro" line for the silver kings. Heavy Monofilament leaders or tippets are required because of the Tarpons tough and rough mouth. Drift fisherman in passes and beaches prefer live baits such as threadfin herring, scales sardines, and dollar sized blue crabs. 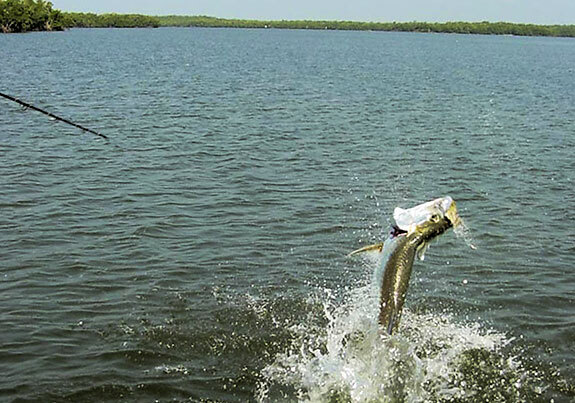 Tarpon season usually is best on Anna Maria and Longboat Key in May, June, and July. Major fishing efforts for big Tarpon are directed at live baiting to large rolling and tailing schools on the beaches and passes. Tarpon in these areas usually range in weight from 60 pounds to 150 pounds. They have been caught to 250 pounds plus. All Tarpon on Capt. Tom Chaya's boat the "Dolphin Dreams" are released very carefully.